All About Sports Cards: The First Topps Prime 9 Redemption Card is Live! The First Topps Prime 9 Redemption Card is Live! ...its time to go visit your HTA Local Hobby Shop and redeem those cards. Want to know who is on the card for week 1? Of course you do. Week one is Hall of Fame catcher Johnny Bench. Here is a look at the card. 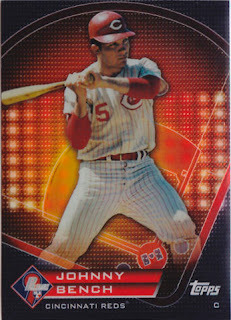 In the previous Topps Player of the Week promotion, the cards were very nice, standard cards. Bench was not one of those 25 players given out. These Prime 9 cards are limited edition Chrome Refractors. The backs of the cards have “Prime 9 Moments” which for Johnny Bench include MVP of the 1976 World Series and Holds catcher’s record with 10 straight Golden Gloves. They are really great looking in person so make sure to get to your participating LCS and redeem those cards. And don’t forget to fill out the back of your redemption card to be entered into a sweepstakes. You could win a trip to the 2012 World Series. 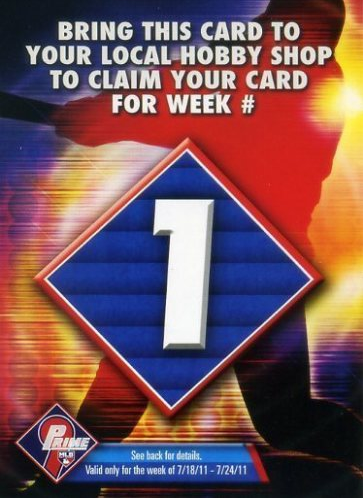 Check in next week to find out who is on the card for week 2.